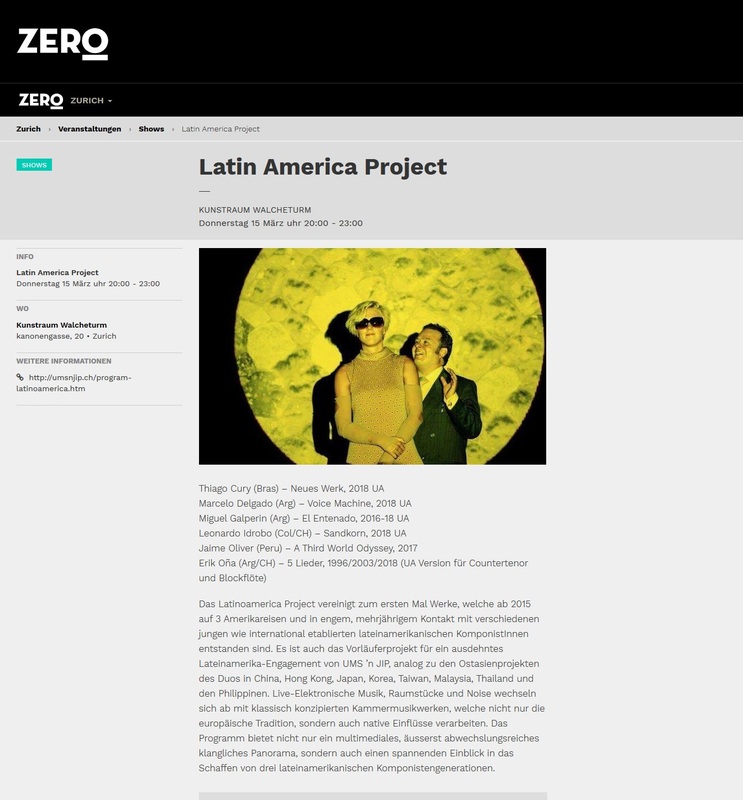 Das Latinoamerica Project vereinigt zum ersten Mal Werke, welche ab 2015 auf 3 Amerikareisen und in engem, mehrjährigem Kontakt mit verschiedenen jungen wie international etablierten lateinamerikanischen KomponistInnen entstanden sind. 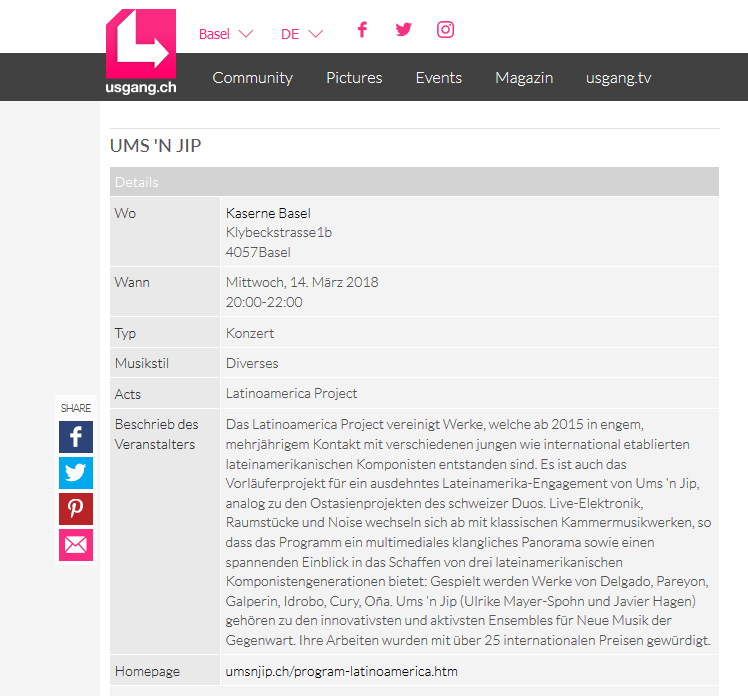 Es ist auch das Vorläuferprojekt für ein ausdehntes Lateinamerika-Engagement von UMS 'n JIP, analog zu den Ostasienprojekten des Duos in China, Hong Kong, Japan, Korea, Taiwan, Malaysia, Thailand und den Philippinen. Live-Elektronische Musik, Raumstücke und Noise wechseln sich ab mit klassisch konzipierten Kammermusikwerken, welche nicht nur die europäische Tradition, sondern auch native Einflüsse verarbeiten. Das Programm bietet nicht nur ein multimediales, äusserst abwechslungsreiches klangliches Panorama, sondern auch einen spannenden Einblick in das Schaffen von drei lateinamerikanischen Komponistengenerationen. 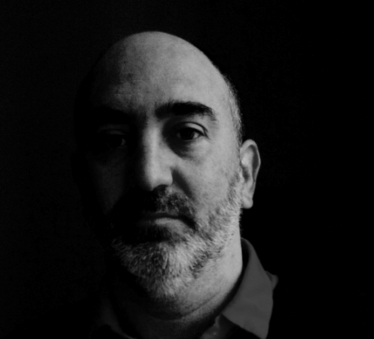 Miguel Galperin es compositor. Nació en Buenos Aires en 1972. Estudió en Argentina con Marta Lambertini y Néstor Andrenacci y en EEUU con Pablo Ortiz y Mario Davidovsky. 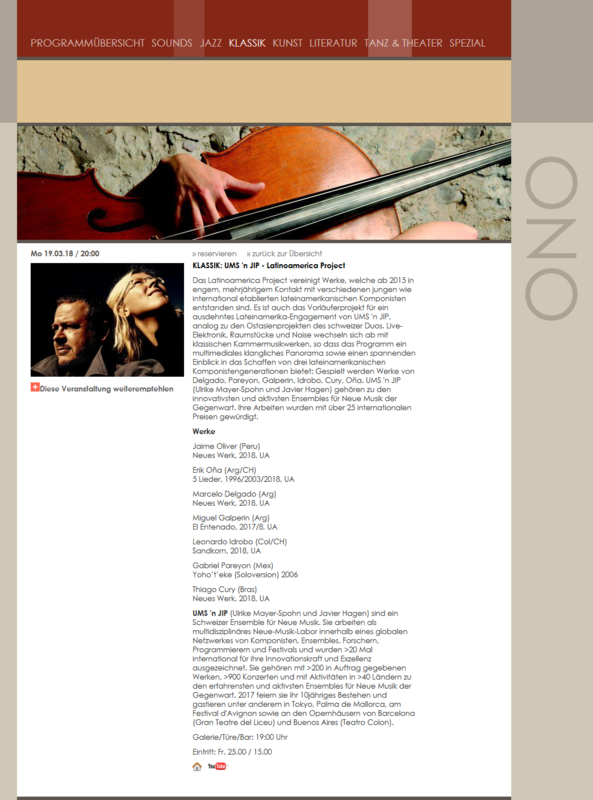 Su obra fue interpretada por Quatuor Diottima, Empyrean Ensamble, Williams/Bugallo duo, ORF Ensamble, Ensamble Neue Musik Bratislava, Reiko Makanabe y Patricia Da Dalt, entre otros, en países como la República Checa, Austria, EEUU, Japón, Chile y Argentina. Fue Profesor Asociado en la Universidad de California, Profesor Invitado en IDAES (Universidad Nacional de San Martín) y es docente de la Diplomatura en Música Contemporánea del Conservatorio Manuel de Falla. 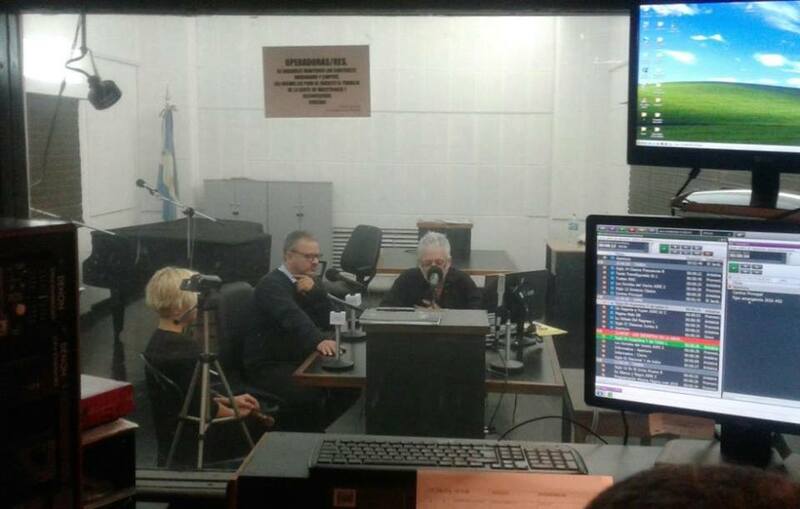 Asimismo trabaja en la Biblioteca Nacional de la República Argentina como coordinador del área de música de la Dirección de Cultura. El Entenado (Obra escénico-musical de Miguel Galperin basada libremente en la novela de Juan José Saer). El Entenado es una obra escénico-musical escrita por Miguel Galperin y basada en "El Entenado" de Juan José Saer. La obra pone en escena al protagonista de la novela. Este personaje intenta darle sentido a su pasado - el de un joven marinero español integrante de una expedición de adelantados del siglo XVI, raptado por los indios Colastiné con quienes convive durante una década - después de cuarenta años y ya de vuelta en Europa. En la rememoración de su singular historia, el entenado descubre que él mismo y la cultura Colastiné son parte de una nueva manera de pensar al ser humano y su mundo. Leonardo Idrobo. Born 1977 in Santiago de Cali, Colombia. In 1995 he moved to Santa Fe de Bogotá to study music at the Universidad Nacional de Colombia. He was there under the tutorship of Roberto García, Horacio Lapidus, Hegberto Bermúdez, Angela Rodríguez and Blás E. Atehortua, among many others. During 1997 he studied composition with Juan C. Marulanda at the Pontificia Universidad Javeriana. This, thanks to a scholarship given by the Fundación Mazda para el Arte y la Ciencia. Between 1998 and 2000 he took occasionally analysis and composition lessons with Rodolfo Acosta R. At the end of 1998, he decided to interrupt his studies and dedicate himself to composition as a full-time activity. In 2001, he decided to undertake a trip to Switzerland with the purpose of studying once again. Basel was the place he chose for this. He studied composition with Detlev Müller-Siemens and Erik Oña, and other subjects with Dorothé Schubarth, Roland Moser, Hanspeter Aeschlimann, Markus Jans, Hans Saner and Jakob Ullmann, among others. He has taken part of several seminars, courses and workshops in Colombia, Spain, Hungary, Germany and Switzerland, as well as composition masterclasses with Coriun Aharonian, Graciela Paraskevaidis, Beat Furrer, Michael Jarrell, Jonathan Harvey, Marco Stroppa, Klaus Huber, Mark Andre, Brice Pauset and Helmut Lachenmann, among many others. In 2008 he assisted the German composer Jakob Ullmann (*1958) in the realization of the electronic part of his piece PRAHA: celetná-karlova-maiselova, commissioned by the Deutschlandfunk, and premiered at the Forum für Neue Musik 2008 in Cologne, Germany. 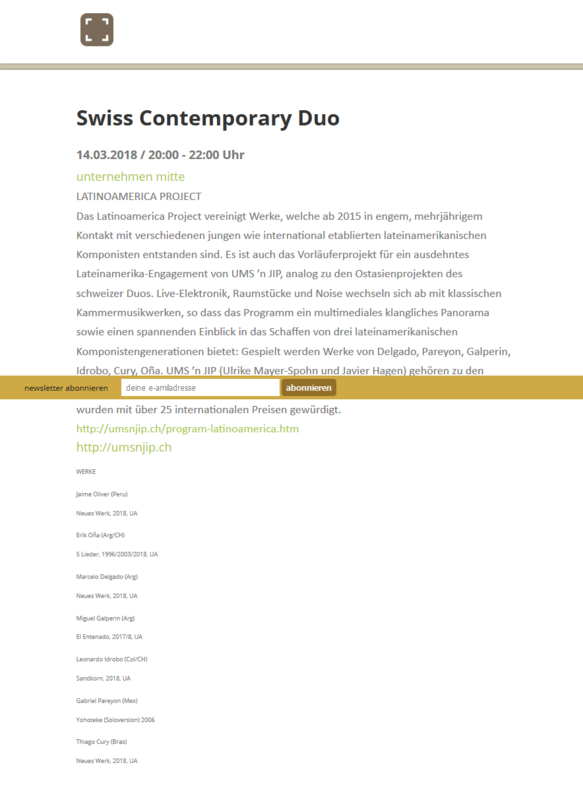 Leonardo Idrobo has won the National Prize for Composition given by the Colombian Cultural Ministry (1997), has been awarded scholarships and commissions given by the Marianne & Curt Dienemann Foundation (Lucerne, CH), Christoph Delz Foundation (Basel, CH), Experimentalstudio des SWR (Freiburg i.Br., Germany), and a residency given both by the Colombian Cultural Ministry and FONCA (Mexico). His music has been played in Colombia, Mexico, Switzerland, Germany, Poland and Hungary, by ensembles such as Tambuco, Ensamble3, Ensemble Phoenix, Ensamble CG, and by the Basel Symphonic Orchestra. Marcelo Delgado was born in 1955 in Argentina where he currently lives and works. He is a composer, conductor and teacher. He founded and directed the Compañía Oblicua, contemporary music ensemble. 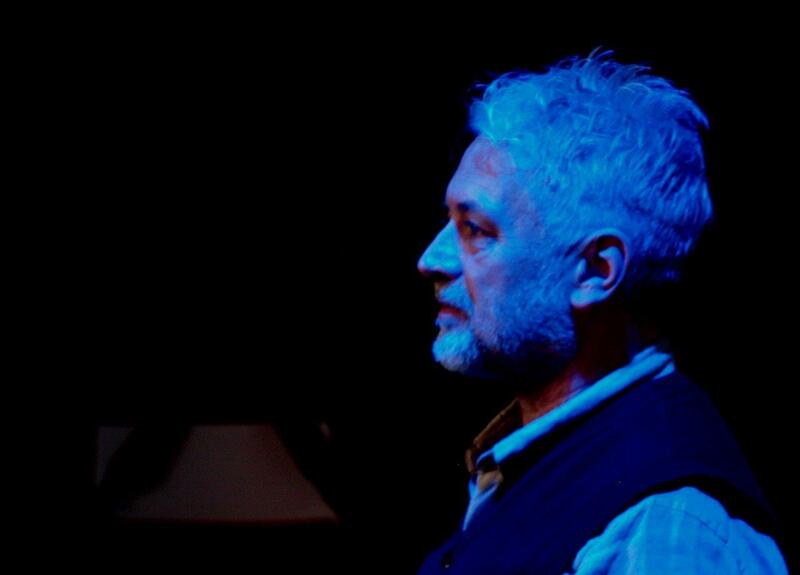 He is also creator and host of the radio show OMNI (Unidentified Musical Objects) on Radio Nacional Clásica focused on the promotion of contemporary music. He is professor of Arts Studies at the Universidad de Buenos Aires (UBA), also of the Conservatorio Superior de Música de la Ciudad de Buenos Aires, and of the Contemporary Music Advanced Studies at the Conservatorio Superior de Música “Manuel de Falla”. 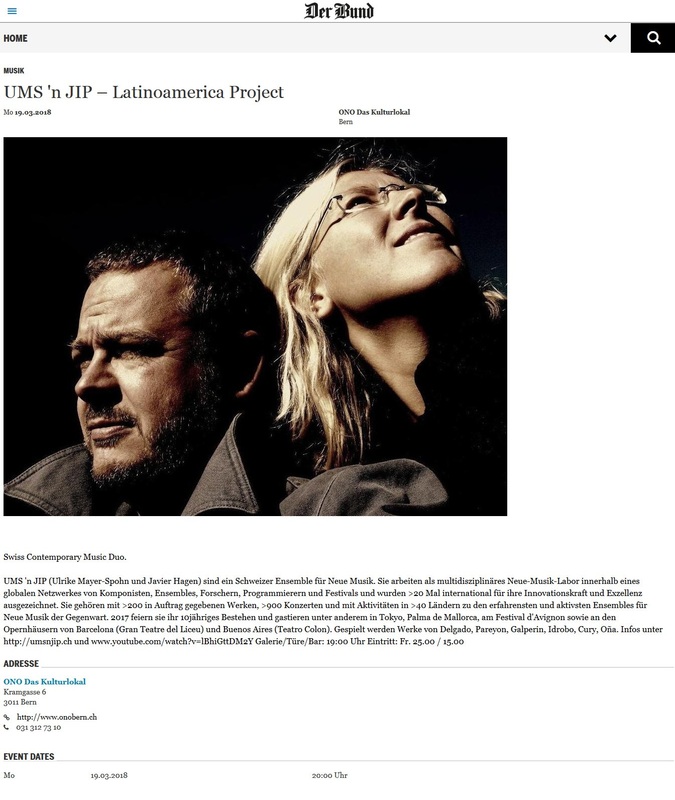 In 2016 he staged UMS 'n JIP's 'Genealogias', a music theater commissioned by Centro de Experimentacion del Teatro Colon CETC for the Festival Nueva Opera de Buenos Aires FNOBA at Centro de las Artes UNSAM. Jaime E. Oliver La Rosa (Lima, 1979). Oliver La Rosa’s music and research explores the concept of musical instrument in electronic and computer music, designing instruments that listen, understand, remember and respond. His open source Silent Drum and MANO controllers use computer vision techniques to continuously track and classify hand gestures. 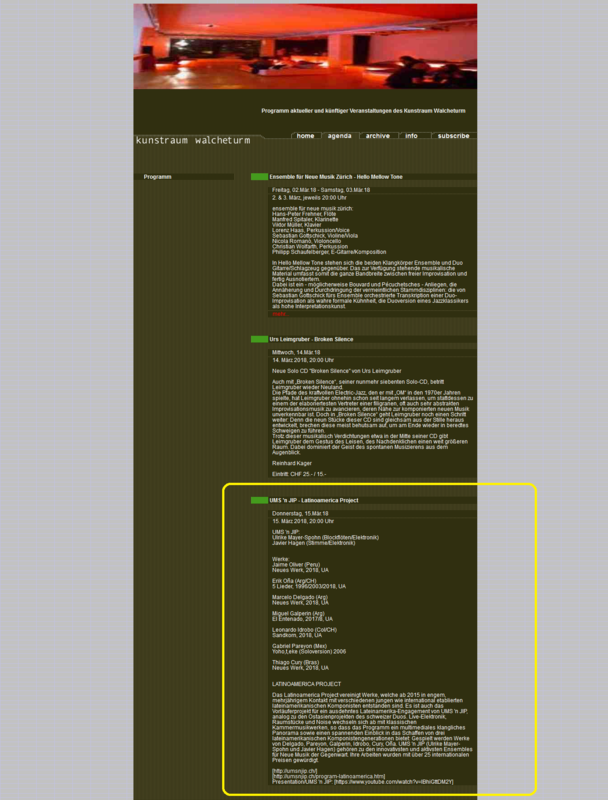 His most recent research [notes] explores computer assisted notation and generative music in Pure Data and LilyPond. His work has been featured in many international festivals and conferences, collaborating with several composers, improvisers and artists in a field of action that spans sound performance and installation, composing and performing music, and programming open source software. 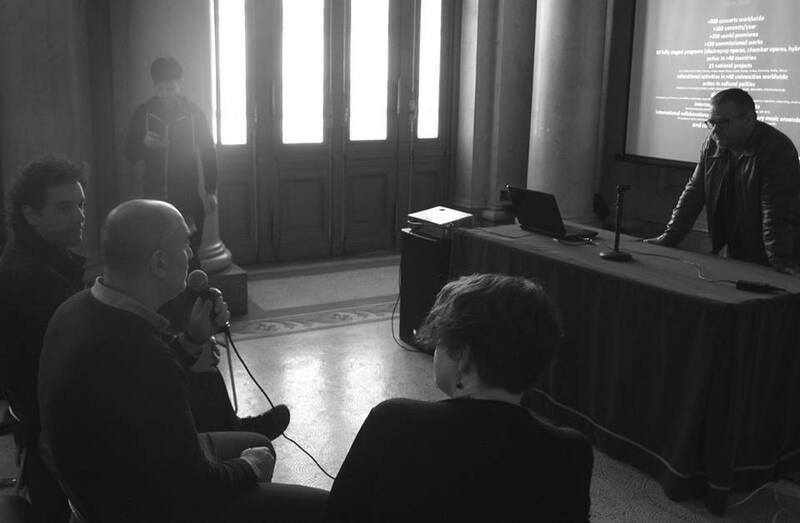 Some recognitions include scholarships and grants from the Fulbright Commission, the University of California, Meet the Composer and the Ministry of Culture of Spain, and composition and research residencies at ZKM and IRCAM. He obtained the 1st prize in FILE PRIX LUX 2010, a GIGA-HERTZ-PREIS 2010 special prize from ZKM and the 1st prize in the 2009 Guthman Competition from the Georgia Tech Center for Music Technology. 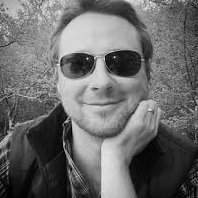 Oliver is Assistant Professor of Composition at NYU and co-director of the NYU Waverly Labs for Computing and Music. He obtained a PhD in Computer Music from the University of California, San Diego (2011) where he studied with Miller Puckette and was Mellon Post-Doctoral Fellow at Columbia University & the CMC in New York. Erik Ona. Geboren 1961 in Córdoba, Argentinien. Musikstudium an der Staatlichen Universität in La Plata, Argentinien und an der State University of New York in Buffalo, USA. Er erhielt zahlreiche Preise, Stipendien und Aufträge, u.a. 1991 Forum '91 mit dem Nouvel Ensemble Moderne, De Ijsbreker, Nieuw Ensemble, Stuttgarter Oper, Hannoveraner Tage für Neue Musik, Europäischer Musikmonat (Basel 2001), Ensemble Intercontemporain. 1998 Stipendium des IRCAM in Paris. 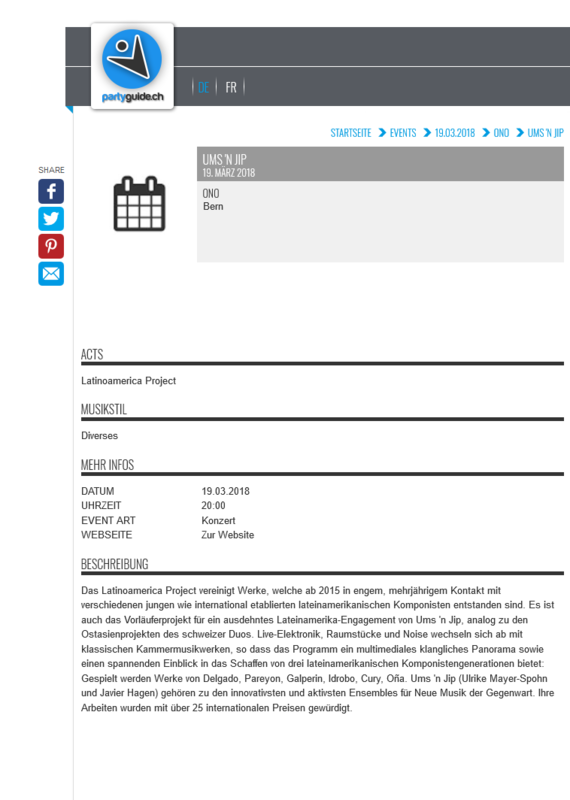 1998/2000/2001 Stipendium des ZKM. 1995/96 Stipendium der Akademie Schloss Solitude. Als Dirigent erarbeitete er zunächst traditionelles Repertoire mit verschiedenen argentinischen Orchestern. Später konzentrierte er sich auf Neue Musik. 1990-93 war er Dirigent am CEOB (Zentrum für experimentelle Oper und Ballett), Teatro Colón, Buenos Aires. 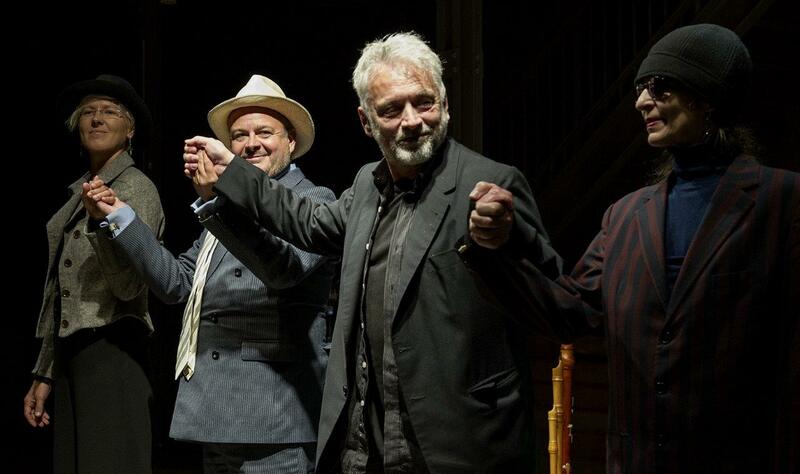 Zusätzlich dirigierte er verschiedene Neue Musik Ensembles wie zum Beispiel Sinfonieta Omega und Chamber Ensemble of the Goethe Institut. 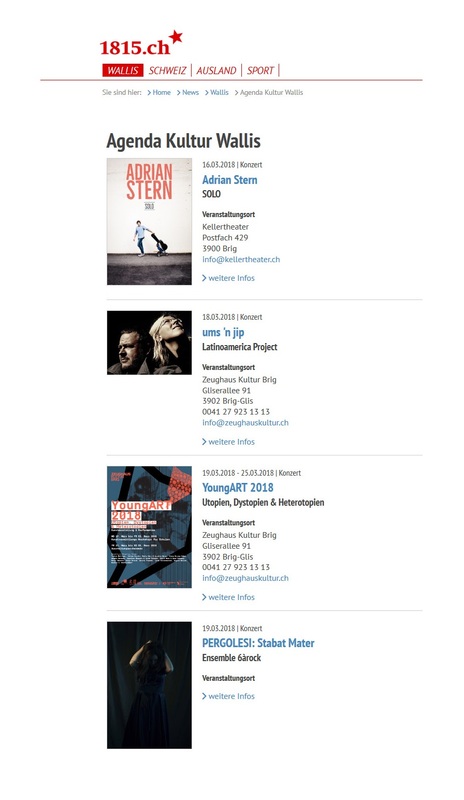 Ab 1993 dirigierte er auch in den Vereinigten Staaten und in Europa, unter anderem: June in Buffalo chamber ensemble, JIB Brass Ensemble, The Instrumental Factor, New York New Music Ensemble, Buffalo Philharmonic Orchestra, Kammer Ensemble Neue Musik Berlin, Champ D'action (Belgien), Ensemble Resonanz, Darmstadt Ferienkurse für Neue Musik und Warschau Herbst. Bis jetzt hat er über 150 Werke uraufgeführt, von Kammerensemble Stücken bis zu Opern. 1994-96 war er Dirigent des Ensembles für zeitgenössische Musik an der State University of New York at Buffalo. Seit 1996 ist er ständiger Dirigent des Thürmchen Ensembles. 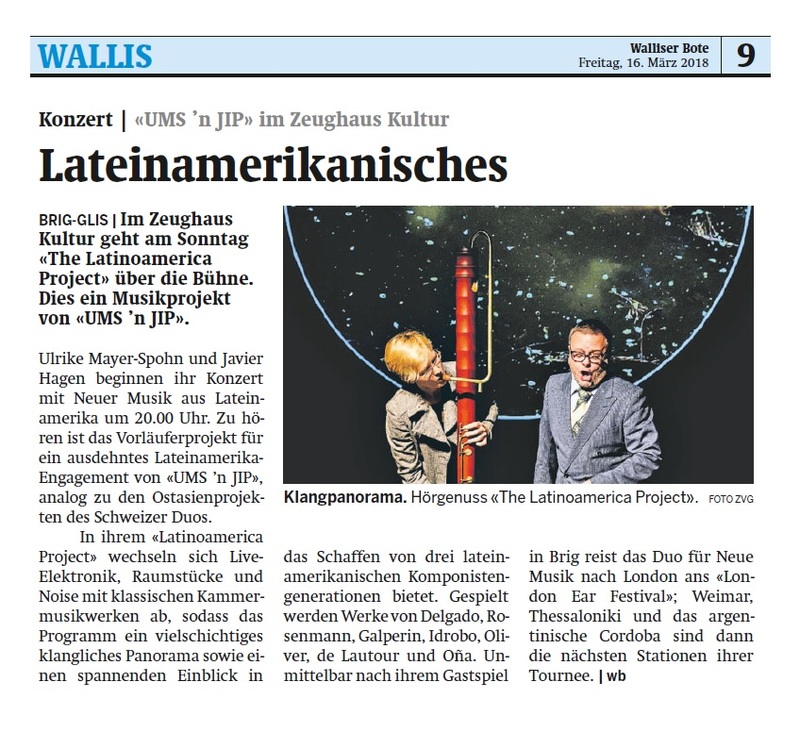 Er ist Gründer und Direktor des Zentrums für weiterführende Studien der zeitgenössischen Musik in Buenos Aires. Von 1989 bis 1993 war er Professor für Komposition und Orchestrierung an der Staatlichen Universität in La Plata. 1995 Gastprofessor für Komposition und Computermusik am Kunitachi College of Music in Tokyo. 1995-2001 unterrichtete er Komposition an der Universität in Buffalo/USA. Bis 2003 unterrichtete er Komposition und dirigierte das Ensemble für zeitgenössische Musik an der Birmingham University, UK. 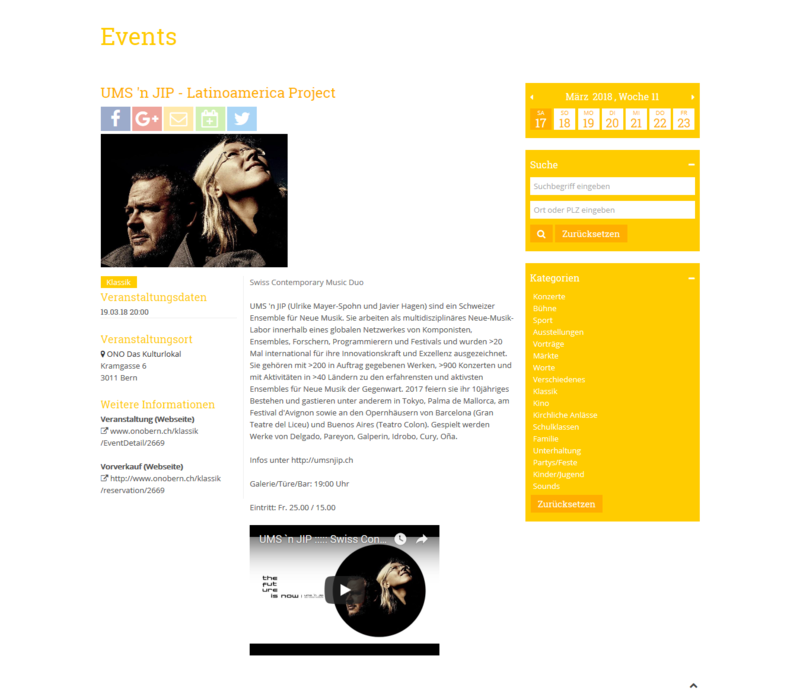 Zur Zeit unterrichtet er Komposition und ist Leiter des Elektronischen Studios der Hochschule für Musik an der Musik-Akademie der Stadt Basel, Schweiz. Mauricio Rosenmann Taub (born 1932), a native of Santiago, is a Chilean composer, writer and poet. He studied piano and composition initially in Santiago, then in Stuttgart and Freiburg with a Scholarship of the DAAD. In Paris he studied at the Conservatoire National with Olivier Messiaen and graduated with distinction (premier prix). During this time Rosenmann worked at the French Broadcast at the "Groupe des Recherches Musicales", studied organ with Édouard Souberbielle and musicology. With André Martinet he studied linguistics at the University of Paris (Sorbonne). He returned to Germany, attended the Darmstadt New Music Summer School and joined in Freiburg the class of Wolfgang Fortner. He graduated with a composing degree ("Reifeprüng in Komposition und Musiktheorie") and became a lecturer at the Freiburger Musikhochschule. He was a professor at the Folkwang University of the Arts in Essen 1974 until 1999. In 1960 some poems by Rosenmann were translated into German and published in Freiburg. In 1969 in both Freiburg and Santiago the book Los Paraguas Del No was presented (review in La Prensa, 1971). Since then, twelve volumes, all conceived as cycles of poems, mainly in Spanish, and several essays have been published as well as compositions for the piano, chamber music and music for the stage, including three operas. 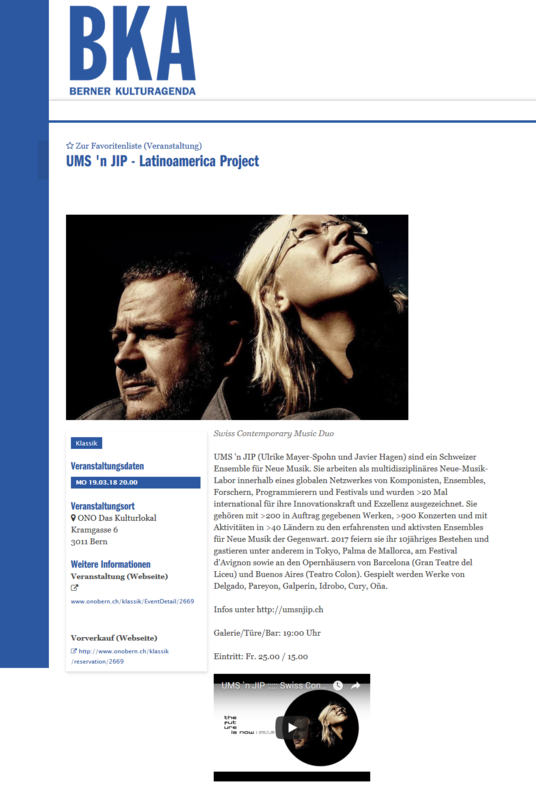 Rosenmann's music has been performed by renowned interpreters in various European countries and in Chile. "The work of Mauricio Rosenmann Taub seems like a labyrinth of various arts in which isolated threads of Ariadna always interweaves back to the crossroads of the past-" (Stefan Fricke in the encyclopedia Komponisten der Gegenwart – KDG, "Contemporary Composers", article Rosenmann, 1997). In his recent poems Rosenmann intend to establish a bond between the musical interval and the likeness within words and their components. Raúl Zurita, National Prize for Literatur: «Mauricio Rosenmann Taub takes us back to this indiscernible age in which gesture, graphic symbols and sound do not form separate compartments. His poems create an awareness before reading them, a feeling as if it were a recollection of future language.» Eugen Gomringer declares: «Sharpening the senses of looking and hearing, we perceive something coming from far away and pointing into future.», and about the book Disparación: "There is nothing more beautiful (and important) in our literature than this book."